We’ve been at sea now for nearly four days, and Dave Withrow, the Chief Scientist, and I have had a chance to visit several haulout sites to count harbor seals. Harbor seals tend to haul out on rocky islands or reefs that provide protection from predators or strong winds. Generally, the harbor seals “haul out”, or leave the water, at low tide, so all of our work is done around this time. We travel to these rocky sites via a small boat that is launched from the JOHN N. COBB, and because the sound of the boat can frighten the seals, we usually jump out at a nearby island, hike to a hidden viewpoint, and use binoculars to count them. When there is no viewpoint available, Dave must count the seals from the boat; however, this isn’t ideal, since using binoculars from a moving, bumpy boat can be quite difficult. A female harbor seal and her pup haul out on a rocky reef covered in kelp during low tide. Photo by Chief Scientist Dave Withrow. There are several pieces of equipment that are important for the study. Dave uses a GPS (Global Positioning System) unit to locate sites that he has visited previously—using this tool, he can identify the precise location of a seal haulout that he has visited in the past, or mark a new location for future reference. He also uses special gyrostabilized binoculars which maintain a stable image, even when his hands are unsteady or he is counting seals from a moving location, such as a boat. All of his data are recorded in a waterproof notebook. Dave brings camera equipment so that he can take photographs of the seals, which can be used later to recheck counts. He also carries a radio so that he can communicate with the driver of the small boat (for this cruise, a coxswain named Chris) and the Commanding Officer of the JOHN N. COBB. Safety equipment is also important, particularly when working in the unpredictable weather of southeastern Alaska. On each boat trip, Dave brings a satellite phone and a GPS-linked emergency transmitter called a PEPIRB (Personal Emergency Position Indication Radio Beacon) that can alert the US Coast Guard if Dave (or anyone else on the small skiff) is experiencing trouble and needs to be rescued. Other safety devices that are commonly used on small boats during field studies include a basic first aid kit, mini signal flares, a bright orange rescue streamer, fire-starting material, extra food and water supplies, and a pocketknife/hand tool such as a Leatherman. Harbor seals haul out for several reasons, including temperature regulation and the conservation of energy. 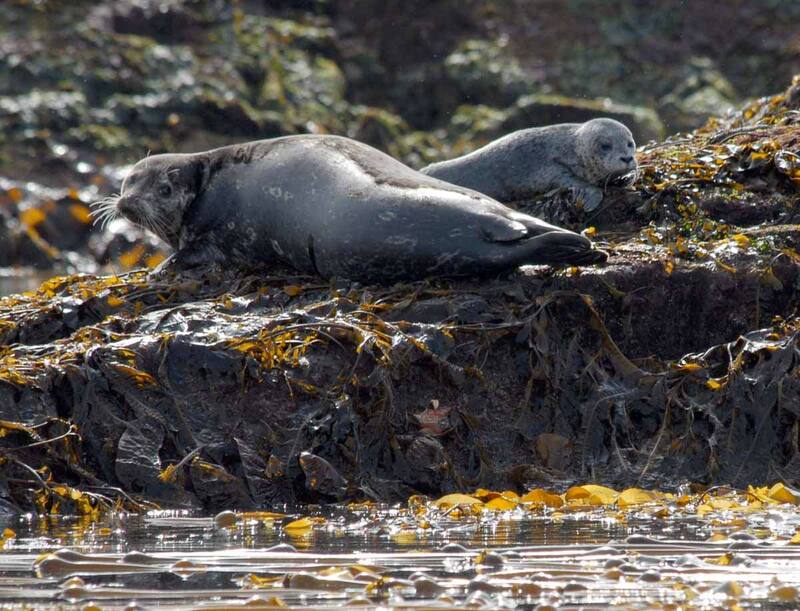 However, in June, the primary reason for hauling out is due to the pupping season, during which females give birth to their young on land and care for them. Dave will compare the number of seals hauling out during the pupping season to the number of seals that haul out during the molting season in August, when the seals shed their fur. We have visited several haulout sites during the past few days, and I have become much more adept at counting the seals and recognizing their shape and color from a distance. Harbor seals vary in color, including shades of white, gray, and brown-black. Often, the lighter-colored seals are older and larger individuals, while the pups are a darker color. At first glance, the seals appear defenseless, like large sausages washed up on to the rocks during a high tide. Their movements are awkward on land—they make their way across the jagged rocks by back-and-forth rocking of their bodies, and once situated, they rest in closely-packed groups, with the pups alongside their mothers. However, upon seeing the silhouette of a person or hearing an approaching boat, the seals smoothly enter the water and swim to safety, suddenly becoming graceful and quick. Tide pools that form among the depressions in the rocky reefs provide a habitat for a variety of invertebrates, including sea anemones, sea stars, and bryozoans. As mentioned earlier, harbor seals tend to haul out on rocky reefs that fringe small islands or the coastline. These rocky sites are only exposed at low tide, and become completely submerged by water during high tides. 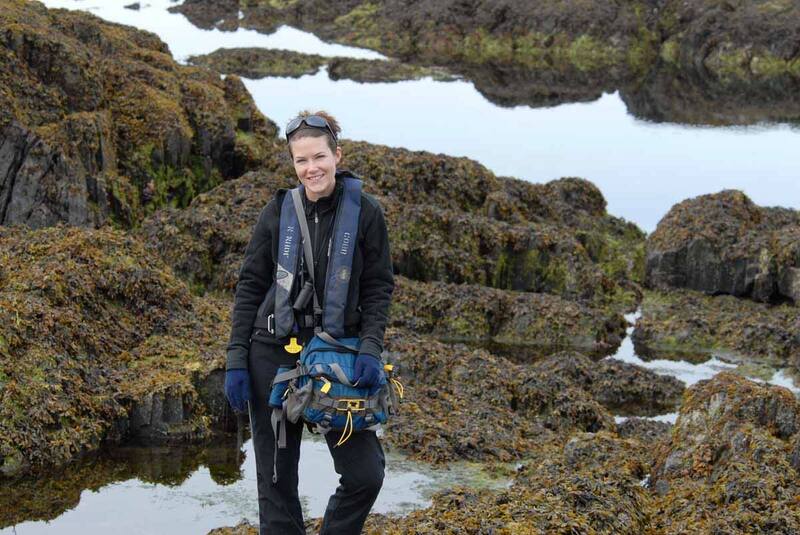 Because we visit the reefs at low tide, the rocks are partially covered in layers of slimy, light-green kelp and green algae that reek of a strong, ammonia-like odor and make for a slippery climbing surface. 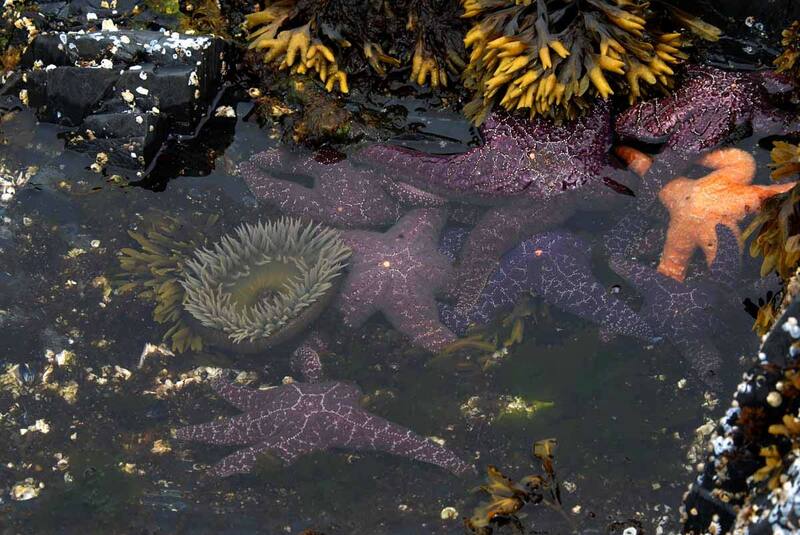 Small tide pools in the crevices between the rocks provide a close-up look at purple and orange sea stars, green sea anemones, small fish, and other tide pool organisms. I finally had a chance to see my first humpback whale yesterday morning. From a distance, it was easy to spot the spray from the whale as it exhaled out of its blowhole. As the whale approached our boat and we turned the engine off, we could hear the exhale as well, and I was able to grasp the immense size of this marine mammal. The humpback whale can reach lengths of up to 45 feet and weigh up to 45 tons, and it is clearly recognizable by the small “hump-like” dorsal ridge that surfaces from time to time. To avoid injuries to the whale, Chris (our coxswain) kept the outboard motor running so that the whale would be able to identify our exact location. Dave attempted to take photos of the underside of the humpback whale’s flukes, or tail fin, so that the whale could be identified. Each whale has an individually unique pattern on its flukes, which acts like a “fingerprint” that can be matched for identification. 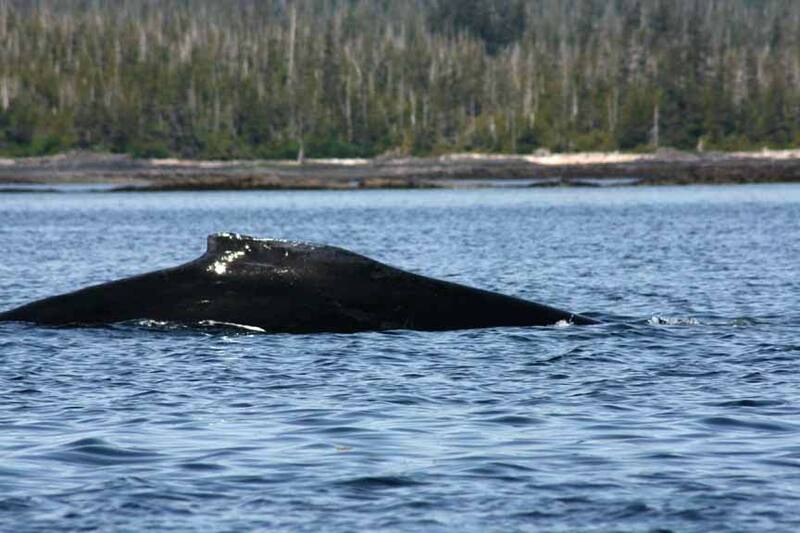 Using these photos, researchers can track individual whale movements within and between seasons. The master north Pacific humpback database is maintained by NOAA’s National Marine Mammal Laboratory in Seattle where Dave works. We snapped a few photos as it maneuvered through the shallow waters and then headed back to the JOHN N. COBB for a late lunch. Scientists can use photographs of a humpback whale’s tail flukes to identify the organism because the pattern on each whale’s tail fin is unique. Tara Fogleman, a NOAA Teacher-at-Sea participant, took this photograph of a humpback whale as it rose to the surface for another breath. We are slowly making our way toward Wrangell, a small coastal town located south of Juneau. After making a pit stop there tomorrow night to purchase fuel and a fuel filter, we will proceed towards the tidewater glaciers at Tracy Arm and Endicott Arm and continue our study of haulout sites. This entry was posted in 2007, NOAA Fisheries Service, NOAA Teacher at Sea, Tara Fogleman and tagged Alaska, glacier, harbor seal survey, haulout site, juneau, noaa ship john n cobb, North Pacific, population decline, sea star, whales. Bookmark the permalink.